Bionanotechnology: Viruses may help build nanodevices. Paraphrased from U.S.News & World Report, Science & Society 1/12/2004, pages 46-47, by Karen Schmidt. Angela Belcher a materials scientist at the Massachusetts Institute of Technology has manufactured semiconductor materials into circuits less than a hundredth the size of devices on a standard microchip using viruses. Her team has developed harmless viruses that can bind and handle 30 different materials, as well as possibly grow wires for some of the world's tiniest transistors. Measured in nanometers, or one billionth of a meter--the length of 10 hydrogen atoms lined up in a row, nanodevices could form the heart of superdense computer chips, more efficient solar cells, and perhaps even tiny factories. And living cells may help construct them. After all, life's molecules are masters at building nanomachines, from the molecular motors in muscle to the tiny cellular power plants that extract energy from food. The idea is to exploit biology's assembly skills to build new nanodevices. Instead of domesticating plants and animals, it's time to domesticate molecules according to the burgeoning field of bionanotechnology. Biology may be able to design nanodevices that build themselves, from the bottom up. Susan Lindquist, Director of MIT’s Whitehead Institute for Biomedical research, is trying to do just that with the help of aberrant proteins called prions. Protein molecules normally fold up like origami into a shape that enables them to do their job, but in prions, the folding somehow goes wrong. Prions are notorious as the cause of fatal brain ailments like mad cow disease , but Lindquist discovered that one kind of prion--from yeast--can do something potentially useful. She triggered a chain reaction in which the yeast prions spin themselves into long, durable fibers. Lindquist then genetically engineered these fibrous prions so they could bind to gold and silver nanoparticles. As she reported in spring of 2003, the result was prion fibers clad in precious metal--ultrafine conductive wires that could someday shuttle electrons around nano-size circuits. Those nanocircuits might draw data from superdense memory devices built with the help of other biomolecules. Andrew McMillan and his team at the NASA Ames Research Center in California started with "heat shock" proteins from microbes that live in hot springs. These unusual molecules assemble into cagelike structures called chaperonins, which help the microbes survive searing heat. In the lab, the team coaxed the proteins to form lattices, with a mesh spacing of just 20 nanometers. The researchers then altered the proteins so they could trap tiny magnetic particles in a dense, regular array--a potential basis for a computer memory 100 times as compact as today's hard disks, says McMillan. "If you could make each 10-nanometer particle represent a bit of data, you'd have the highest memory storage [currently] possible," he notes. 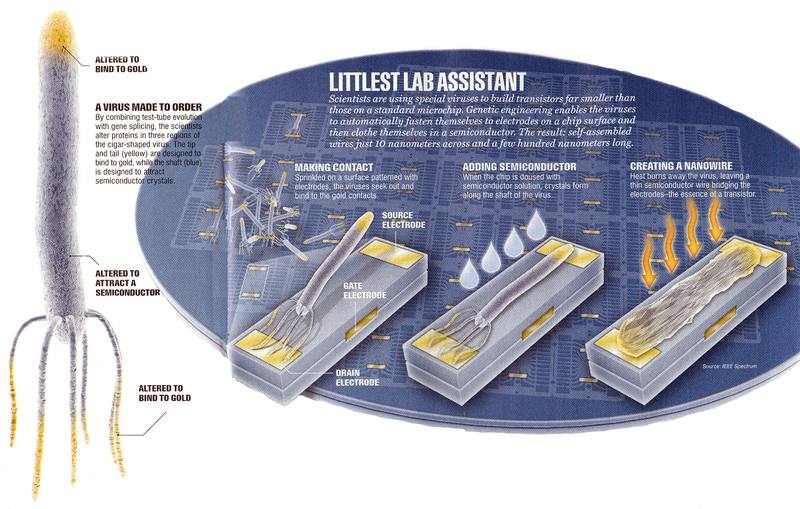 Other aspiring nanoengineers work with DNA. DNA strands snap together like precision parts, with each strand seeking and linking to another strand containing a matching sequence of genetic code. Erez Braun and his team at the Technion-Israel Institute of Technology recently exploited that property to build circuits out of carbon nanotubes--whiskers of carbon just 1 nanometer across. Nanotubes have extraordinary electrical properties that could make them the basis of future nanoelectronics. But manipulating and wiring up these tiny rods isn't easy. Two months ago in the journal Science, Braun and his team described how they used DNA, along with certain proteins, as "smart Velcro" to connect nanotubes to minuscule electrodes. The result was a set of nanotransistors--the basic components of a computer chip--that built themselves in a test tube. Of all the approaches to exploiting nature's molecules, Belcher's most resembles true domestication. Her viruses, called bacteriophages [viruses that normally infect bacteria], are little more than DNA with a protein coat, but they do reproduce. She lets them multiply by the billions. Belcher selects viruses that contain proteins which can bind to certain materials. After many selective breeding cycles and artificial selection she has produced viruses that not only bind to a semiconductor, but also trigger the semiconductor materials to crystallize all over their coat, forming tubular wires. By combining test tube evolutionary selection methods with gene splicing, Andrea Belcher of MIT is hoping to alter the bacteriophage coat proteins in 3 regions of this virus. The tip and tail (yellow) would be designed to house gold binding receptor proteins, while the main body of the bacteriophage's coat (blue) would hold proteins able to bind semiconductor crystals, possibly creating an electrical circuit less than one-hundredth the size of standard microchip circuits. Belcher and her research colleagues at MIT are attempting to further alter the viruses to have a tip and a tail that can stick to gold. The resulting viruses could then hook themselves to gold electrodes, and create semiconductor wires that complete a circuit, forming transistors. The team soon expects to make a prototype, and then it's only a matter of time before the virus-built transistors can end up in a real device. Schematic diagram depicting a genetically engineered M13 virus displaying peptides for the direct nucleation of inorganic materials and/or further assemble viruses into complex heterofunctional arrays. (a) M13 virus, with engineered peptides fused to pIX shown in green, to pVIII shown in red, and to pIII shown in blue. (b) Nanoparticles represented as spheres localized on the viruses illustrate the potential of multiple materials engineering into one viral structure, whose length and shape can be custom-tailored depending on the genome size engineered. Genetic alteration of the M13 virus basic building block to insert nucleation centers via specific peptide inserts and subsequent formation of self supporting thin films, fibers and various multifunctional arrays have a unique programmable potential for materials and heterostructured devices. Three genetic engineering modification schemes of protein for the formation of templates to organize and direct growth of materials are currently being investigated: 1) specific peptide insertion and subsequent inorganic nucleation on the five copies of the pIII subunits (blue) at one end of the virus 2) specific peptide insertion and subsequent inorganic nucleation on the pVIII major coat protein (red), and 3) specific peptide insertion and subsequent inorganic nucleation on the five copies of pIX subunits (green - at the other end of M13 virus - see figure above). The helical major coat protein, pVIII, of the M13 viruses can be engineered to express fusion proteins that readily self-assemble into a highly oriented viral coat structure. Peptide sequences engineered into the pVIII protein serve as nanocrystal templates for binding affinity towards either ZnS or CdS, and the ability to affect nucleation and growth of nanoparticles during synthesis .